I've had a busy busy busy weekend! Saturday I babysat all day/night - I babysat for two boys in Lewisville from 10-6 and I brought them to this fun place called Going Bonkers so that they could run around and burn some of their energy! We couldn't go to the park since it was so cold out! Then Saturday night, I babysat from 6:30-10 for two kiddos in Flower Mound, and I will be babysitting again for them this Friday night. I had fun :) these kids were cute - a 5 year old girl and a 3 year old boy. I think they liked me..They didn't want to go to sleep! LOL. During his nap, my Mom and I went out to get mani/pedis! It was MUCH needed, we hadn't had a pedicure since The 3 Day - which was in November! Now my feet look cute again! And my nails look pretty good also! 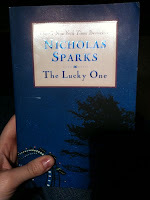 This is now the fourth book by Nicholas Sparks that I'm reading. I read both "The Choice" and "Dear John" in two days! I also read "The Last Song" pretty quickly, also. I'm in love with his books! He's such a great author! I never thought I'd enjoy reading this much! LOL..